TRUST IS a central concept in the conduct of domestic and international politics. Without it, governments can find themselves alienated from those they govern, and even autocratic rulers who aren’t subject to the ballot box can risk seeing their governments besieged by popular uprisings and toppled — all because they lost the trust of their people. So too in foreign affairs, nations and their governments who do not cultivate, build and nurture trust in their relations with other countries can see their pursuit of peace and prosperity engulfed by animosities that, if not properly managed, can even lead to war. And yet, trust as a concept in international relations theory is largely ignored in favor of structural theories that seek to define why nations behave the way they do. In Northeast Asia, it is no exaggeration to say that varying gaps in trust among nations — especially China, North Korea, South Korea, Japan and the US — are at the heart of the obstacles that stand in the way of geopolitical certainty and the confidence necessary to ensuring stability. Some of those gaps are deeply rooted in history, including colonial aggression and militarism in the 19th and 20th centuries, but some too are rooted in contemporary provocations, most real, some perceived. In Southeast Asia, meanwhile, political developments related to the evolution of the Association of Southeast Asian Nations demonstrate that mutual confidence can be created over time, although it is not altogether clear how many of those lessons can be applied to Northeast Asia. 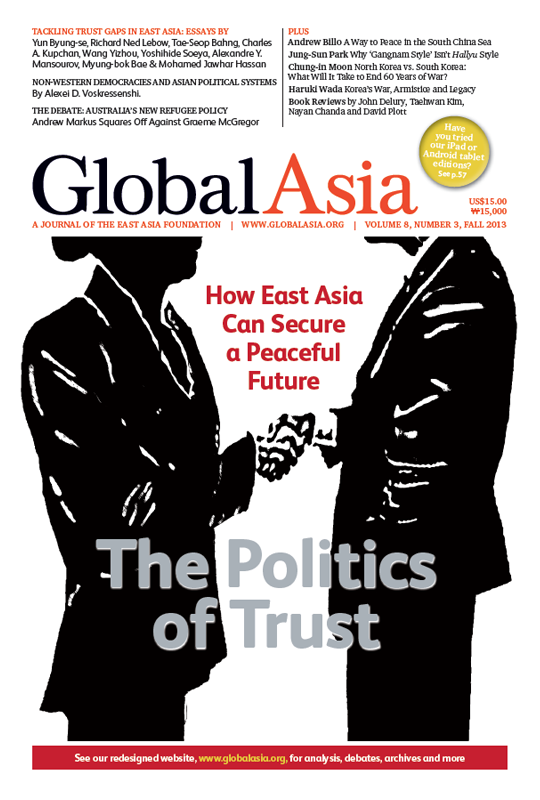 In this issue of Global Asia, we devote our cover package to examining the lack of trust that continues to permeate international relations in Northeast Asia, and how trust-building might become a mechanism for enabling progress toward regional peace, stability and prosperity. To be sure, continued tensions and mistrust between South Korea and North Korea represent perhaps the most difficult challenge. South Korea’s new President Park Geun-hye, before her election, articulated her now well-known concept of trustpolitik, as a foundation for both North-South relations and domestic politics. It remains to be seen how effectively trustpolitik, described in this issue of our journal by Foreign Minister Yun Byung-se, will be implemented. Our In Focus section is closely related to our cover topic, and explores the legacies of the Korean war and what it will take to end the armistice and replace it with a genuine peace regime on the Peninsula. Elsewhere, we again look at how resource-sharing in the South China Sea — including fisheries, hydrocarbons and sea-lanes — could help resolve maritime disputes there. We also feature a debate on Australia’s new refugee policy; a look at whether Korean rapper Psy is redefining the Korean Wave; and whether the experiences of Asian political systems call for a new concept of “non-Western” democracy. Finally, we continue to expand our book review section, and intend to increase it further in future editions. Trust is a central concept in international affairs. Nations that do not cultivate, build and nurture trust in their relations with other countries can see their pursuit of peace and prosperity engulfed by animosities that, if not properly managed, can even lead to war. This is especially true in Northeast Asia. Trust-Building in Southeast Asia: What Made it Possible? Is Australia’s New Refugee Policy the Right Approach to Boat People? Given the cultural, historical and religious differences between Asia and the West, is it time for a concept of non-Western democracy, wonders Alexei D. Voskressenski. Korea at War — North vs. South: What Will It Take to End 60 Years of War? Reviews of new books by Peter Marsh; Adam Szirmai, Wim Naude & Ludovico Alcorta; Joe Studwell; Glenn Hubbard & Tim Kane; Daniel A. Bell and Chenyang Li; Charles K. Armstrong, etc. Reviewed by John Delury, Nayan Chanda, etc.